I’ve been running competitively since the seventh grade and have seen firsthand what this sport does to people; teaches, strengthens, heals. I learned a lot about myself and others through interval repeats on a track and across muddy cross country courses. Team work, characteristics of a leader, and a good bit about mitochondria are just a few things this sport has expanded my knowledge on. Post collegiate career, I was looking for what was next and decided to take on the marathon. Little did I know that running had another important lesson in store for me. On December 1st, 2017 I stood in a corral waiting for the start of my first marathon in Memphis, Tennessee. I grasped the hand of my best friend and college teammate, shaking my legs just a little to keep them warm. To my right, in the crowd, was my dad, my big brother, and my boyfriend. They wore purple shirts that read “Lindsey Beth Support Team.” I grinned from ear to ear. Nerves seemed to crackle through me. I had put in a lot of miles preparing for this race. After my collegiate running career ended, I’d asked my friend Heather if she’d run a marathon with me. She might have been skeptical, but she didn’t take any convincing. “Oh gosh a marathon… Okay!” came her reply. Over the next six months we trained, kept each other updated and accountable, and fundraised for the kids of St. Jude. My brother wrote my training plan and encouraged me to take time to listen to my body, rest, and back off the mileage whenever I needed it. But I pushed through; I crammed in the miles and basked in the exhaustion that a long run delivered. Heather and I decided that we wanted to qualify for Boston and in order to do so we needed to run the marathon in under 3:35:00. Our pace would need to be just shy of 8:12 per mile, but that would only allow us to qualify. For the 2018 Boston marathon, cut-off times were drawn at those who had bested the qualifying standard by three minutes and twenty-three seconds or faster. With that in mind, I was shooting for closer to 3:30:00. 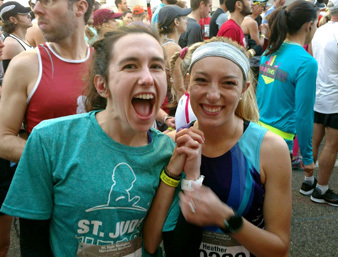 On race weekend, I reunited with several running teammates and felt my heart swell with emotion knowing some would be on the course with me and others would be cheering us on. WHAT?! We were cruising! But I knew she had more in her, so I waved her on and smiled with pride. For another mile I continued to feel on top of the world. It was time to take more fuel, and since I’d already consumed what I’d carried with me, I’d be accepting it from race support. Except when I reached mile sixteen I turned down the Gu in hopes of something else. There was nothing else but water and gatorade. Uh-oh. No way would I backtrack for fuel; I’d simply take something at the next mile marker. Suddenly, I didn’t feel like I was soaring anymore. My legs began to feel weary as a slow ache started crept in. At mile seventeen there was no fuel, only water and gatorade. Crap. I took the water held out and glanced at my watch. My pace wasn’t suffering, yet. At mile eighteen I eagerly took a Gu packet and forced it down, but it was too late. My legs were starting to feel like heavy weights. Each mile dragged on. Despite very slow miles towards the end of the race, I crossed the finish line in 3:30:14. I had never felt so sick and exhausted in my life. I’d also never felt so proud. For the next ten months I waited to submit my time for entry to the 2019 Boston Marathon. 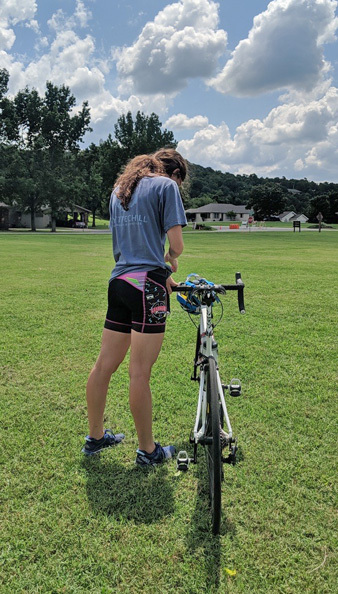 I ran a lot less, but trained occasionally and completed my first Tri in the summer of 2018. I was in Colorado, just returned to cell service after a backpacking trip around Maroon Bells, when I got the email saying I’d missed entry. I was signed up for my first Ultra marathon, a relay race through Northwest Arkansas, and another marathon in Tulsa scheduled for November 18th. But my motivation faltered. 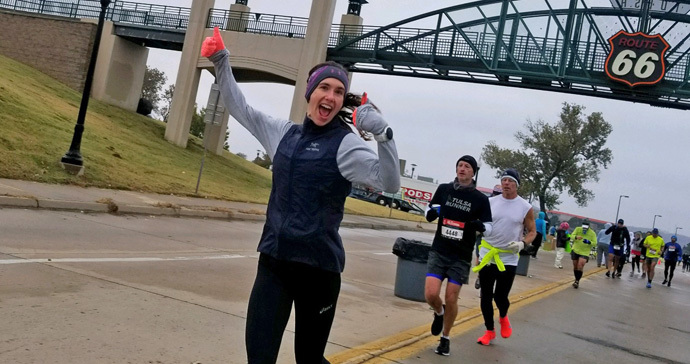 The Route 66 marathon in Tulsa was supposed to be just another chance to feel out the distance. It was supposed to be a chance to learn a little more and implement a better strategy before heading to Boston in 2019. But I didn’t get in to Boston 2019 and it was hitting me harder than I thought it would. I’m a marathoner! I can continue running for twenty-six miles in a row and then stumble through that last point two as long as I’m promised a chocolate milk at the end. Isn’t that enough, to have completed the distance? But that’s one of the many beautiful things about this sport. There’s always more. You can always go longer, faster, higher. Achieving a goal should be celebrated, yes, but there will always be another one to chase. Over the next month my training was less than ideal. I got out the door a few times a week and shuffled down the river trail to squeeze in a few miles here and there. 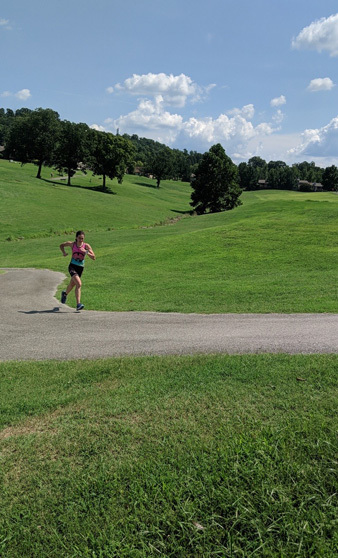 I completed my first ultramarathon as part of a team of six, my own leg totaling nearly thirty-six miles at the end of the adventure race through the Ozarks. It was in that race that I realized I might have it in me to re-qualify for Boston. Despite less training and my runs being completed at a much slower pace than the lead up to my first marathon, I began to ponder the possibility of running faster than I had nearly a year before. I tried not to think about it too much. I decided it was best to just see what happened. On November 18th, 2019 I stood in the coral for the start of my second marathon. The weather was not beautiful, and I had far fewer supporters on the course. What did lift my spirits was that my dad and boyfriend were bundled up against the wet and the cold saddled on their bikes in order to meet me at different points on the course. This time, I had all the fuel (Honeystinger packets) I’d need for the entire race in my pocket. I did my little dance to keep warm. Again, I cruised through the first fifteen miles. I took my third fuel packet at that time and continued to soar for another five. I waited to hit the wall. I was tired and starting to feel it in my legs, but I did not take a turn for the worst. My legs kept rolling and my pace didn’t falter. After the race, that I finished with a time of 3:26:16, I basked in the pain that coursed through my legs. That afternoon, I mostly staggered around in wonder. How, with much, much less training, had I ran faster than the year prior? How, on a hillier course with cold, wet weather, had I cruised at a steady pace from start to finish? My answer came only after plenty of time mulling over the race; not over-training, a much better diet in the year of 2018 featuring more whole foods, and a relaxed demeanor heading into the race. I believe in the power of hard work. It takes a lot of miles, a lot of hours, a lot of sweat etc. etc. in order to become a great runner. That’s one thing I love about the sport; talent doesn’t mean near as much as dedication. It’s important to be consistent, to crawl out of bed when you don’t want to, and to push past minor aches and pains in order to get faster. However, it’s also important to rest and take a step back. What shocked me about my improved marathon time, was that the pay off came not after a season of intense training or diligent work, but rather after a season of rest and casual strolls. I’m sure this sport has a lot more to teach me, but this go around, it taught me to be patient and to remember to enjoy it a little bit more. Sleep in, skip a run, eat some ice cream; then refocus, eat right, and get to your starting line.